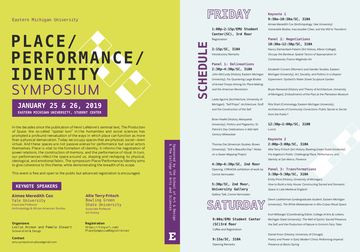 EMU School of Art & Design is pleased to announce a multi-day new symposium: Place/Performance/Identity, January 25-26. 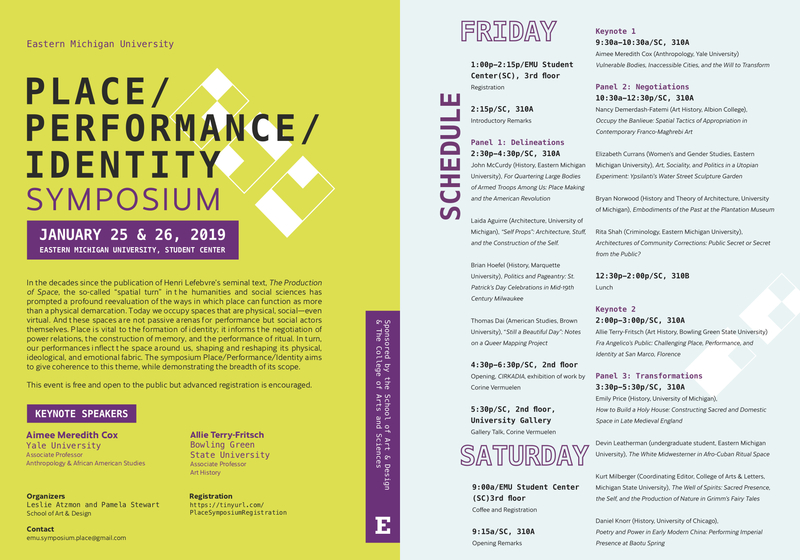 Details on the event, including a schedule and downloadable program is here. Registration for this event is strongly encouraged. Click here. EMU Student Center January 25-January 26. 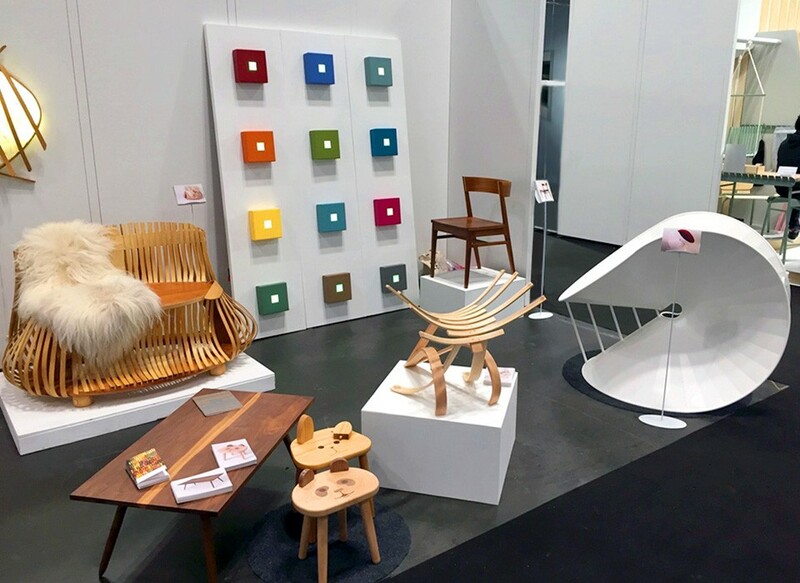 The EMU display included a freeform bent wood davenport, a meticulously crafted dining chair, a sculptural chair featuring pyrography, a reclaimed walnut coffee table, and a pair of juvenile stools with special features for children to play with. 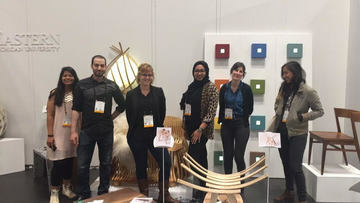 A group of Eastern Michigan University students joined 14 other universities participating this spring in one of North America’s most prestigious furniture design events—the International Contemporary Furniture Fair, held in the Jacob Javits Convention Center in Manhattan. 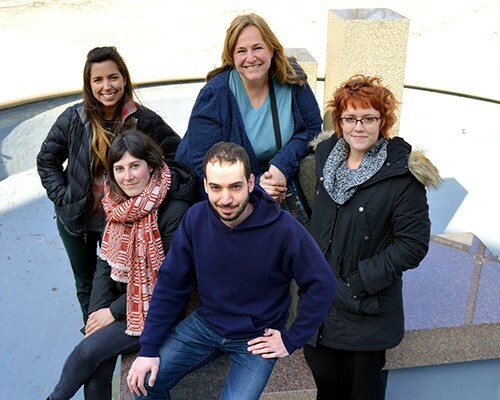 Back Row: Lorena Ganser, Undergraduate Student, Drawing and Painting; Laura Earle, Graduate Student, Furniture Design; Melissa Judd, Recent EMU Alumna, Furniture Design. Front Row: Sara Steenbergh, Continuing Education, Furniture Design; Taj Ali, Recent EMU Alum, Furniture Design. Not pictured: Dulce Morales, Undergraduate Student, Furniture Design; Esraa Malky, Graduate Student, Interior Design. Earle, a graduate student in the furniture design program in the EMU School of Art & Design, spearheaded the trip for the group, which included two introductory students, a continuing education student and two recent graduates. Attendees included Lorena Ganser, an undergraduate student concentrating in drawing and painting; Dulce Morales, an undergraduate in furniture design; Esraa Malky, a graduate student in interior design; Sara Steenbergh, a continuing education student in furniture design; and recent furniture design graduates Melissa Judd and Taj Ali. Participating schools included the Rhode Island School of Design, known as one of the top art schools in the country; along with the University of Iowa, the University of Oregon, the Rochester Institute of Technology and Virginia Tech University. The fair is billed as the premier North American global design showcase for furniture, flooring, lighting and other accessories, attracting more than 700 exhibitors and 33,000 attendees. The annual event also features a schools program, aimed at fostering emerging design talent from universities such as Eastern Michigan. 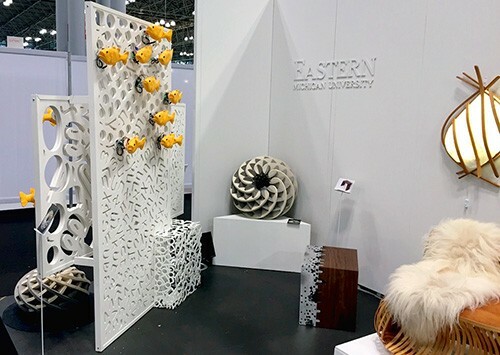 Earle exhibited several designs, including a distinctively shaped steel chair, an accent table made of aluminum cast into walnut, and interlocking felt ottomans noted by Design Milk on its “The Best of ICFF” blog. Earle’s animatronic wall divider caught the eye of several attending hospital architects interested in discussing such an installation for children’s cancer wards. Animatronic refers to the use of robotic devices to emulate an animal, in this case fish. An animatronic fish wall divider, left, was among the student work exhibited in the show. 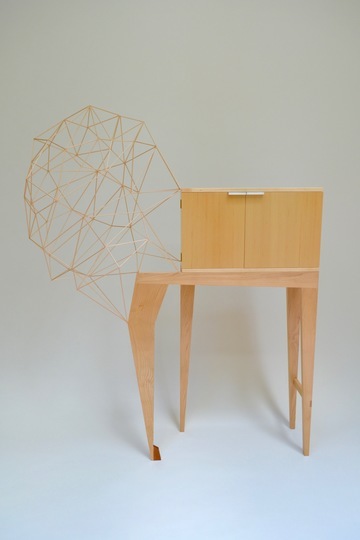 Other EMU student designs included a freeform bent wood davenport, a meticulously crafted dining chair, a sculptural chair featuring pyrography (the art of decorating wood or leather by burning a design on the surface with a heated metallic point), a reclaimed walnut coffee table, and a pair of juvenile stools with special features for children to play with. The group, which stayed in a youth hostel, received financial support from the School of Art and Design and a grant from the Furniture Society, a nonprofit, educational organization headquartered in Asheville, N.C.
Earle savored her meeting with Castle, whom she calls “a rock star” of the furniture world—a legendary artist that everyone in the field knows and admires. Earle, from Pittsfield Township, has a background in graphic and product design, earning her undergraduate degree from Purdue University in visual communication design and industrial design. But, with her children grown, she began graduate studies at Eastern. She was in the interior design program at first, but took a furniture design class and was enthralled. The EMU School of Art & Design receives national accreditation from NASAD, the National Association of Schools of Art & Design!